Clark, who died Tuesday at age 74, had what it took. Granted, his songs may not have peaked on the charts, but the respect he earned as a revered contributor to many a distinguished artist’s canon—including Johnny Cash, Emmylou Harris, Brad Paisley, Rodney Crowell, Ricky Skaggs, Vince Gill, John Denver and Kenny Chesney—made him an icon in Americana realms, one of the first to push the parameters of country music and give it a wider point of view. His songs were told from the vantage point of many a tattered troubadour—the losers, loners, drifters and dreamers—and as a mentor any number of up-and-coming artists, people like Steve Earle and his pal Townes Van Zandt, he helped make that no-nonsense style an indelible part of our modern musical idiom. Indeed, it was that same rugged, tattered perspective that gave his material its air of authenticity. “If I didn’t see it happen, I know somebody that did,” he added in retrospect. Here then, are a dozen of Guy Clark’s best, immortal songs that reflect that wise and worldly view. Taken from his album of the same name and written in the aftermath of his beloved wife and co-writer Susanna’s passing in 2012, “My Favorite Picture of You” expresses Clark’s profound grief in one of the most vivid, yet reassuring ways. Here, he clings to an old photo of the two in happier days, when both were alive and flush with optimism. While many of Clark’s songs appealed to the romantic nature of a ragtag existence, this particular offering raised the bar on romance in a very real and poignant way. Written for his father after his dad’s passing, this vivid, tear-stained narrative revolves around a family heirloom that’s passed from father to son and emblazoned with more meaning than any tool of the trade could convey. It’s a song about tradition, principles and taking the harder challenges, even when the easier tack allows for cutting corners. His mother gave the knife in question to his father when he went off to fight in World War II and later, a much younger Clark broke its blade. “A better blade was never made, it was probably forged in hell,” he recalls. Sad yet stately, it illustrates how a seemingly innocuous object can offer vivid memories for those left behind. One of the most covered songs in Clark’s catalogue—The Highwaymen, Jerry Jeff Walker, Tom Rush, Rita Coolidge, Nanci Griffith and Slim Pickens are among those that have laid claim to it—it draws on the romantic notion of the outlaw as a Robin Hood of the Old West, an individual that rejects the ground rules thrust on him by an uncaring society as he seeks to pave his own way. Clark claimed that the song was inspired by his grandmother’s boyfriend Jack, who became a grandfatherly figure to him as a young boy. Released on his 1975 debut Old No. 1, it, more than any other song, laid out the course of his career and the entire outlaw country genre along with it. Famously covered by Johnny Cash, the song details the bitterness and bravado of an old outlaw who, “relived the days of living by the gun / When deadly games of pride were played / And living was mistakes not made.” Still feeling the weight of his gun and the smell of the gunpowder, he watches as time passes him by while railing against current circumstances where he’s dodging cars rather than dodging bullets as he did in days gone by. Half crazy, he takes to the street for one last showdown, only to be mowed down by an automobile. The pathos is pervasive. Despite his darker musings and tangled view of life and its attendant sorrows, Clark had a way of seeing the world in the pretext of the simplest things—in each of these cases, for example, the homegrown joys of down home desire. While life can take its toll, the ability to retrace ones roots gives more than a measure of comfort, and these two songs sum those sentiments up succinctly. Savor the flavor, grab a beer, and let the aroma waft over you. Clark offers another song about leaving the world behind, but this time, he writes from the point of view of a female hitchhiker whose only goal is survival. Where she ends up hardly seems to matter, and indeed, why she’s taken to the highway seems far less important than the very fact that she’s mustered up the courage simply to do so. Clark sums up that determination succinctly, comparing her to prisoners who “have a way with a file.” Brilliant. Here we find Clark in search of his muse, or perhaps some deeper desire. The imagery is as striking as ever, but this time the meaning is more elusive. “And that old time feelin’ draws circles around the block / Like old women with no children, holdin’ hands with the clock / And that old time feelin’ falls on it’s face in the park / Like an old wino prayin’ he can make it ‘till it’s dark.” Clearly, it’s imbued with equal measures of dreams and desperation, but for what reason, one wonders. Here Clark gives us serious sentiments wrapped in a veil of uncertainty. Another song seeped in nostalgia and clearly autobiographical, Clark details a memory of sitting by the side of the railroad tracks when he was about six years old. He sat along with 50 or 60 people from his hometown and his adopted grandfather Jack, as they all wait for, “a mad dog, runaway red-silver streamline train” to pass through town. In a larger sense, it marks the end of an era when the smoke-spitting locomotives that used to rule the tracks pass into history. Yet, despite the excitement and anticipation of those who gathered for the occasion, the train roars by without slowing down for a second. Consequently here again, Clark offers an analogy of life as it passes us by, marking the transition from the old to the new with scarcely any time for adjustment or acclimation. The lesson that’s learned is that one must either get on board that train or wallow in its wake. A song sung for the returning soldiers from the conflicts in Iraq and Afghanistan, “Heroes” adeptly sums up the experiences of a vet who “brought the war home with him” and “still finds himself wrestling with the demons in the cold, hard truth.” Like many of those who are at the center of his songs, this particular individual had honorable intentions before those experiences altered his perspective. The VA should make this their anthem. “Heroes, everybody needs heroes / Even heroes need a little help.” Let’s hope the plea gets answered. One of his most outspoken activist offerings, “Coyote” describes the toll taken by the scourge of human trafficking. Like “Heroes,” it’s taken from his very last album, My Favorite Picture Of You, demonstrating the fact that even in his final years, Clark retained his eloquence and his concern for those trampled by society’s indifference to its most unfortunate victims. 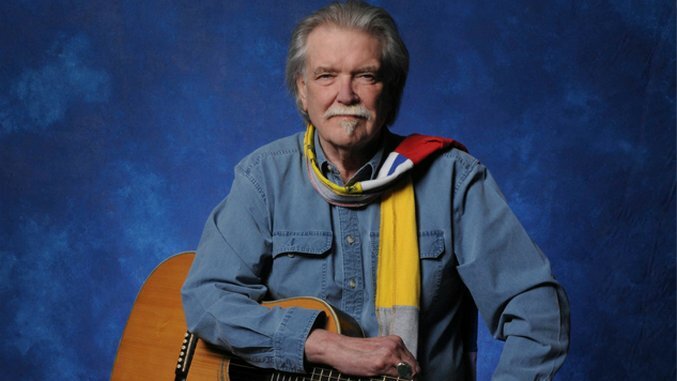 As both the voice of the common man and one of its more pervasive personalities, Guy Clark will clearly be remembered forever.